Do I Like Pina Coladas? Wow. My old sneakers are looking awfully beaten up, aren't they? Perhaps one of these days I should treat myself to a new pair. But hmmm, what kind? Boy...these ones look awfully popular, don't they? Link from George Takei's Facebook page, naturally. Oh Myyy! Well, bummer bummer bummer! I thought I was going to share my harpoon practice video with you today but somehow of the 5 clips I thought I had strung together in QuickTime, YouTube only picked up 2. I will try again over the weekend with that. In the meantime, here's the campsite I picked for the weekend. TQ couldn't make it up until Sunday morning because of work, so I took my little blue tent (I love my little blue tent!). Laurie and I got up there pretty late so the campsite was pretty full, but I found a nice little sheltered spot tucked in under a juniper tree. Turned out that my chosen campsite came equipped with a 5 a.m. wakeup call. Sing it, birdie! Still pretty busy at work, but I thought I would just take a quick break to share this 2-minute snippet of a rolling demo that Sebago clubmate Milton did during Saturday's lunch break at the Hudson River Greenland Festival. Alison Sigethy explains as Milton runs through a series of layback rolls, beginning with the basic Greenland sweep roll ("Kinnguffik paarlallugu/nerfallaallugu - "coming up on the other side, on one's back") and progressing to an attempt at the "elbow roll" (Ikusaannarmik niaqoq/pukusuk patillugu — "only with the elbow, touching the head/ neck"). These are just a few of the 35 capsize manuevers that the most skilled Greenland kayakers can perform. For the full set, many including video clips and all with sound clips of Greenland great Maligiaq Padilla pronouncing the Greenlandic names, click here to visit QajaqUSA.org. - that's where I got the 2 translations above. Enjoy! Hudson River Greenland Festival 2013 . Well, my work week's going all to heck --how is it that there are only three business days left in June??? -- so I don't know when I'll have time to write about it but I had a lovely weekend at the Hudson River Greenland Festival, held annually at Croton Point, and here are some pictures. I worked on my forward-finishing rolls (argh, the ones I used to have but lost through lack of practice, very frustrating) on Saturday and then after torturing myself that way for both Saturday sessions, I switched over to something completely different and took Adam Hansen's harpooning class on Sunday. Wonderful weekend! The photo above was taken as the participants saddled up for the Saturday morning session. click here to visit the gallery. These are the stars of this weekend's 5th Annual North River Historic Ships festival, along with circus performers, some friendly sea creatures, and artist Frank Hanavan, who'll be there to teach knot tying (he likes to frame his nautical paintings in ropework for a very neat and salty effect). The festival is being held at Pier 25; it kicks off with a gala reception on Thursday night, June 20, and then continues through Sunday afternoon. For full details, visit the North River Historic Ships Society's website at NRHSS.org. Should be a great weekend there at the Hudson River end of North Moore street. And if you happen to go on the 22nd, watch the waters for speeding outriggers - no, it's not Hawaii-5-0 shooting in NYC, it's the annual Hawaiian Airlines Liberty Challenge hosted by New York Outrigger. E lauhoe mai na wa'a! And as if that's not enough fun for one weekend, you've also got the Mermaid Parade Saturday afternoon. Grrrr, baby! And where will yours truly be during all of this maritime fun? Why, brushing up on my rusty rusty Greenland skills at the Hudson River Greenland Festival, of course! I made it in off the waiting list, and I'm looking forward to it, but boy, if I hadn't gotten in I sure wouldn't have ended up sitting at home being sad - I think I would've done the Mermaid Parade on Saturday and come into the city for the festival on Sunday. No excuse for boredom on this solstice weekend, huh? The Gowanus Challenge was SuperFUNd! So about that canoe race on the Gowanus - there was no way I was going to be organized enough to race yesterday -- but even if I could have, I don't know if I could've resisted the chance to go take some pictures of the craziness. The Gowanus Dredgers launch site is at 2nd Street, and there's a bridge at 3rd Street that made the perfect photo perch. OK, the guy with the drone probably got the best shots of all of us, but it was still a ton of fun. Here a few of my favorite photos from the day. There are lots more pictures over on a Picasa gallery I'll link to at the end -- if you were in the race, you are probably in there, go check it out! I got to the Gowanus around 10:30, with the race scheduled to start at 11:00. I had actually never been to the Dredgers' launch site before but when I turned a corner and saw the scene below, I figured I was in the right place. Sam Adams beer was a major sponsor and sent a team. Here is a Brewer-Patriot making devil horns at the drone. "I didn't agree to drones!" Here's the starting line - canoes and the one brave haz-mat suited SUP'er awaiting the starter's gun. GO GO GO! Some people took it very seriously. Others...eh, not so seriously. Sandy and Danny in their double Greased Lightning cut off the Hazmat Viking. But despite the failure of the canoes to impede the progress of the guy in the pink unitard, he was still unable to catch the blazing Greased Lightning. Here he is heading for a 2nd place finish. More of the pack racing for the finish. If there'd been an award for best smile I think this lady might have won. 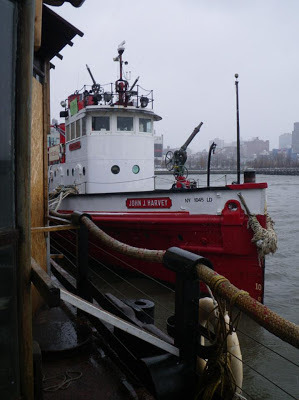 Thanks to the Gowanus Dredgers for a great day! Want to see more of the day's fun? Click here to go to the gallery. Enjoy! Photos by Rob Buchanan, taken during the summer intensive workshop he's teaching at the New School, "Environmental Action and Research: NYC Waterways". More info and links at the end! The race is historic because, to the best of our knowledge… this is the first race where entire course, and the ensuing awards banquet will be held completely on a US Government sanctioned Superfund site. We were unable to get USOC sanctioning, so we'll settle for EPA. The race and lunch party are on June 15th 2013 and we challenge all other boathouses to field teams, and independent kayakers to come on their own and join the fun! Now how's that for some good Brooklyn chutzpah? Go Dredgers! 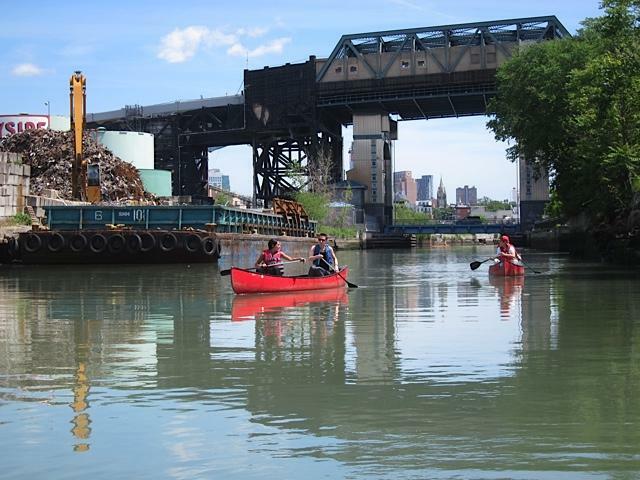 The race is a 2.5 mile round trip from the Gowanus Dredgers boathouse to the mouth of the canal and back. It's open to all human powered vessels and the start is scheduled for 11:00 am. Should be tons of fun to either participate or just watch from the shore and cheer the paddlers and rowers along. 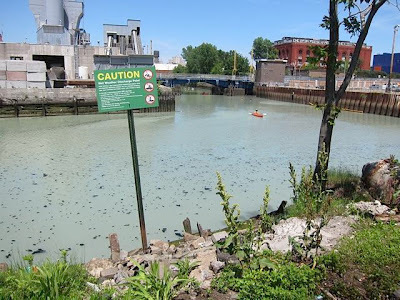 For full information, visit their website at www.gowanuscanal.org - click to go there. BTW, it is a fundraiser so if you're a fan of the Dredgers or just think this crazy race is a fun idea, you can pick a team and put a little money their way - gear costs money, safety and first aid training for guides doesn't always come cheap, and they offer free trips on the Gowanus all summer. Every bit helps! I STILL haven't paddled the Gowanus, this blog about urban boating desperately needs a post about paddling the Gowanus Canal. That almost certainly won't be this weekend, I let this one sneak up on me, best I expect I can manage is spectating and picture-taking (which I'd actually love to do, and not paddling means I can bring the good camera) -- but maybe sometime this summer. Sorry about the short notice, if I did this professionally I think I'd have to fire myself -- or at least give myself a good dressing-down -- for always doing this! Click here for more info on the program. Also, if you haven't visited it before, Rob's been maintaining a fantastic site about the little pocket beaches that are all over NYC (if you just know where to look) for years. I think his site was among the inspirations for the NYC Watertail (see Trip Planning Tools in the sidebar for a link) and it's just gotten better over time. Click here to visit newyorkharborbeaches.org. 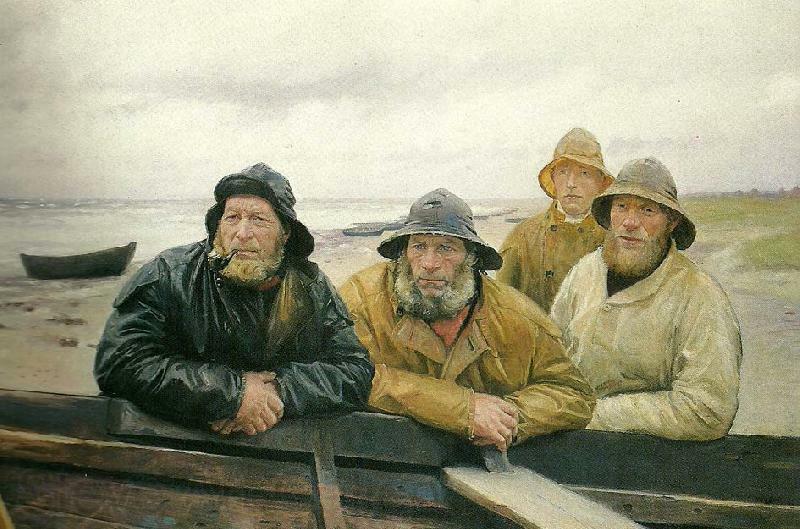 Here are some fine salty dogs modelling some very practical outfits for today's weather, at least here in the Northeast. It is a soggy, soggy day! Painting by Danish artist Michael Peter Ancher. I saw this on Facebook and had to share! It's year-end close here at the Really Big Children's Book Publishing Company, so I won't be doing much blogging this week. I did want to put up this one link that a friend from work posted on my Facebook wall yesterday, though. 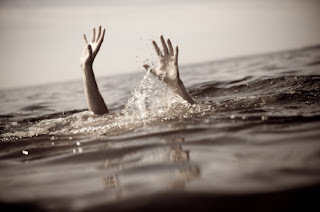 We're finally getting into swimming season for the non-polar-bear set here in the Northeast, and this article talks about something that I think a lot of us would never have guessed on our own. Drowning Doesn't Look Like Drowning. Busy week, but I thought I'd post tonight to share some interesting changes to the categorization of life jackets and possible changes to what types kids are allowed to wear. Facebook may be a ridiculously annoying thing at times but boy, sometimes you really do find out some interesting stuff. This one was thanks to Pat Byrne at Desert Sea. Pat is very active in the leadership of the Rio Grande Yacht Club in New Mexico, including being heavily involved in Race Committee activities. He does a fair amount of musing on his blog about safety issues - much more thoughtful posts, in many ways, than my usual parrotings of commonsense safe boating practices, and he keeps close tabs on boating regulation developments. The life jacket discussion that a few of us had on my wall today started with my posting the photo above, grumbling, "Oh, West Marine, West Marine, why aren't your happy paddlers wearing life jackets?" West Marine is a large and fairly well-regarded marine supply company - I shop at the Manhattan one fairly often and the staff there are very well-informed, know what they're talking about. I would expect this kind of omission from WalMart but I expect a better example from West Marine. In fact this bothered me enough that I passed it along to a friend who's professionally involved in boating safety in the tri-state area, thinking he might know somebody there who could do something about it, if not this time, than in the future. 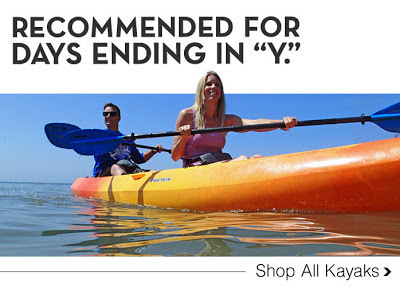 Well, at first he was similarly concerned but about five minutes later he came back and said that if you looked at the full-sized web version of the ad (click here), you could see that the couple actually were wearing belt pack inflatable life jackets. Oops. He was right, of course. It takes sharp eyes and knowledge that such things exist to realize that that's the case, and I think the message that kayakers should wear our life jackets would be better conveyed with a more visible device, but in a way the picture is spot-on - sitatop paddlers in a warm area with placid blue water are just the folks who might wear a beltpack where they'd be reluctant to wear anything bulkier, and as the saying goes, "The best lifejacket is the one you'll wear".The comments then went off into a discussion about the relative merits of the various types. Through the whole thread, I was using the word "life jacket" and Joe from The Horse's Mouth mentioned that he'd been taught to say "PFD". I responded I had too but recently the ACA has been going back to "life jacket" because it includes the word "life", which is what the things can and do save if used properly. That was when Pat came in with the information that that change had actually started with the Coast Guard and that that was only going to be the first of a number of changes that we could be seeing in terms and in labelling as the CG works to harmonize US standards with international ones. An additional legislative change involves the possibility of youth wearing inflatables - at this point they are not allowed to but that's apparently the subject of a lot of discussion. Got a youngster who doesn't like their conventional life jacket? Stay tuned, things might change. Thanks again, Pat, I'm glad to be aware of it - it's good to know when these kinds of changes are in the pipeline.